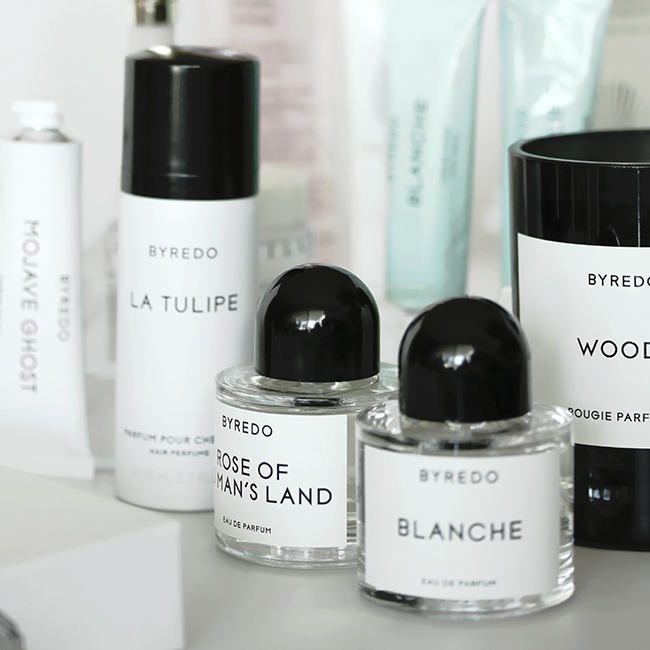 Byredo is all over social media lately, but it really piqued my interest when my friend Sabrina of The Beauty Look Book starting featuring more of her splurges last year. I had seen an older bottle of Inflorescence with the original label on my sister's vanity for years, but it is very heavy on freesias and jasmine. I was very particular in my choices and I am overjoyed by my whole order. Now that the packaging has been revamped and the fragrance line expanded, I figured it was time to share my first impressions and top picks! Spoiler: I'm impressed and want more. My first choice for fragrance was Blanche because I was specifically looking for something clean and fresh and simple. 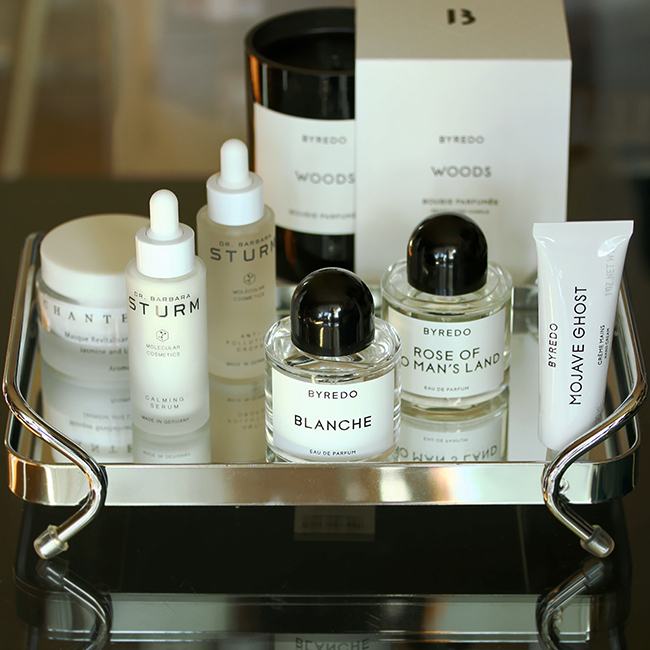 Ben Gorham, the founder, explains that this Eau de Parfum is built around his perception of the color white. The top notes of aldehyde and pink pepper are very unusual choices for me, but I think he was successful in his mission to capture innocence in an unexpectedly different in a crisp and understated manner. Blanche is perfect for work for life for days I can't make up my mind. In a way it feels neutral yet wearable. I read some reviews saying it is overly reminiscent of laundry but I don't find it to lean that direction on my skin. 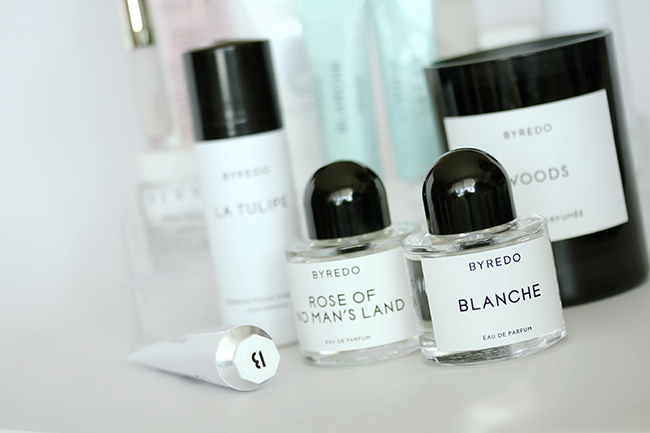 Blanche layers well with my second Eau de Parfum from Byredo below in case you're into that sort of thing. My love of rose drew me toward Rose of No Man's Land. I loved the story behind it, and I love the fragrance even more because I think this is one of the best roses I have sniffed and worn in years. 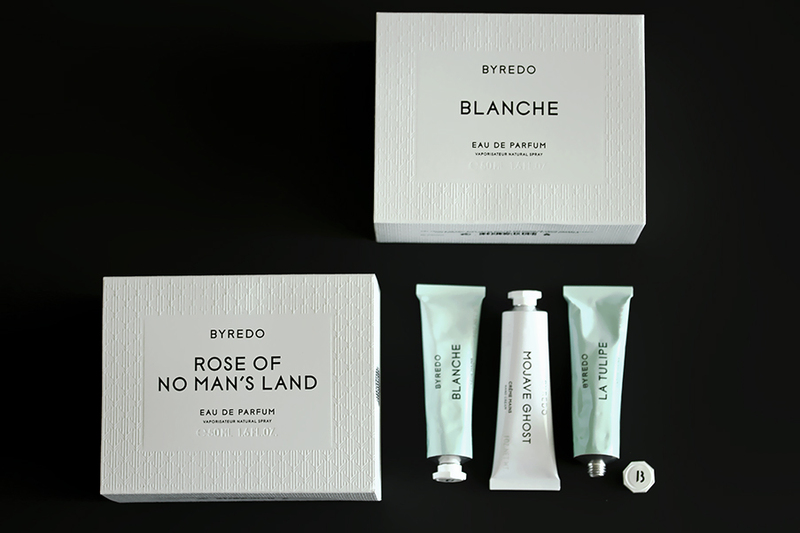 Rose of No Man's Land is what soldiers during WWI would call the nurses who braved their lives on the front lines, and what a stunning noteworthy tribute this is. Appropriate for heroines, indeed! I think the heart of raspberry blossom and the papyrus base give this Rose of No Man's Land Eau de Parfum a modern twist and set it apart from other popular Turkish rose offerings on the market. I wear Atelier Cologne's Pomelo Paradis during the day, but this is officially my evening fragrance moving forward. 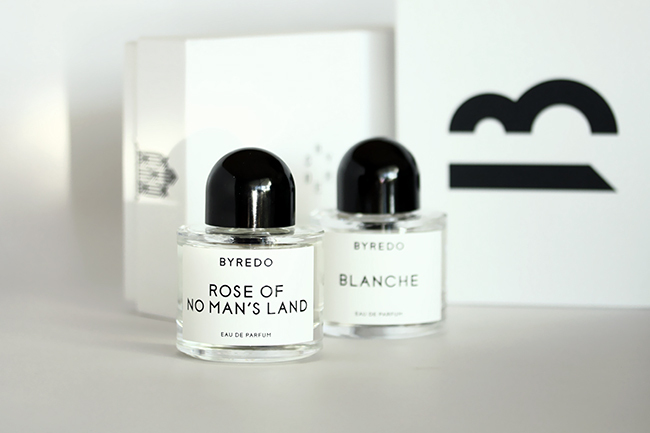 Byredo offers a Rose Noir if you seek a darker more intense rose quality, but I am assuming it may likely be too heavy for my taste. All the Eau de Parfums are offered in other formats such as the Body Wash, Body Lotion, Body Cream and Bath Oil and my new beauty goal is to collect a few so I can marvel at the gorgeous packaging. From the sans serif font to the smooth domed caps and embossed boxes, Byredo emodies minimal elegance at its finest and I fully comprehend the addictive appeal. Next up is the La Tulipe Hair Perfume. Yes, you read that correctly. I've only ever used Christophe Robin's Rose Volumizing Mist but that's equal parts hair care and scent. 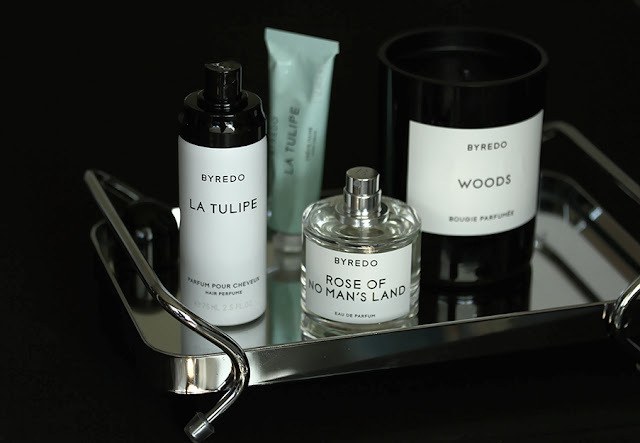 The Byredo hair perfume is fragrance driven and formulated specifically for your locks which means it is non-drying unlike Eau de Parfums which contain alcohol. The hair perfumes have a unique silicone and polymer formula that creates "an invisible veil to leave the hair nourished and luminous whilst divinely scented." I especially love the top note of rhubarb in La Tulipe, but I think the CR Rose Volumizing Mist is a better bang for your buck. It looks beautiful on my vanity so I will treasure it and use this sparingly like on date night! Mojave Ghost was the sample EDP included in SpaceNK's The Spring Edit and unfortunately, the scent doesn't sit well or linger on my skin. Oriental florals are not really my style anyway but it's so odd.. I have been loving and enjoying the Mojave Ghost hand cream because it is true to the description, woody yet graceful. Truly unexpected! The heart note of violet is what I detect most, but the fragrance starts to dissipate rather fast, about fifteen minutes. The Blanche hand cream has the opposite effect because it lingers for thirty minutes at least. I find the soapy character that some noses are more sensitive to in the EDP are more pronounced with the hand cream so I use less than a pea size. I like it, but I don't love it. The hand cream formula itself is phenomenal. It is more balmy, dense but almost whipped and doesn't leave behind a residual film of grease in the name of hydration. Instead it reminds me of a protective salve in that it dries down quickly with a velvety finish which seems to seal in moisture. 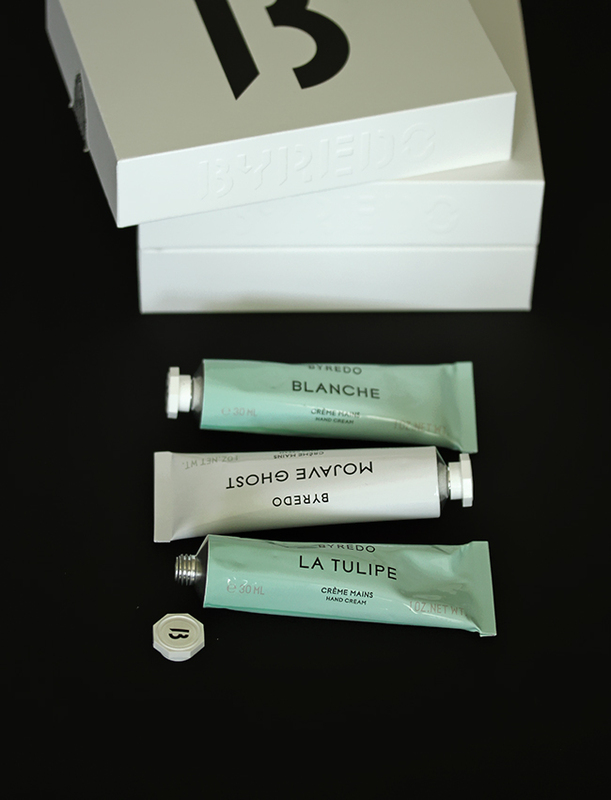 I am so grateful to my friend Sabrina for gifting me the limited edition aqua duo because the La Tulipe Hand Cream is exceptional! It is sweeter smelling than I had anticipated, so memorable and feminine. They're undoubtedly pricy but I plan to purchase a couple to keep in my purses, but that's really just an excuse to order some of the pristine white tubes! 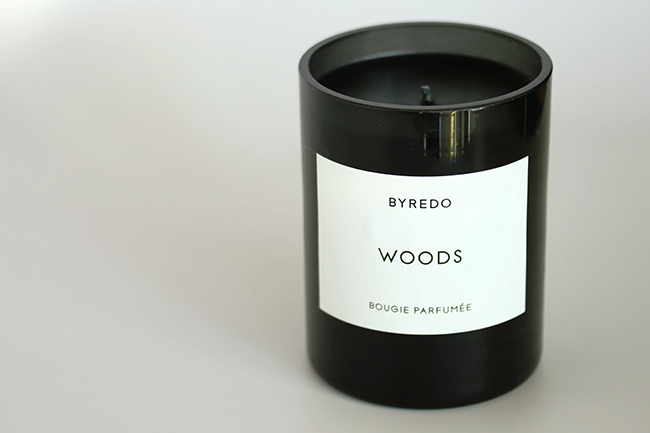 Last but not least to wrap up this haul is Byredo's newest Woods Candle which just landed at SpaceNK. Based on the ounces, pricing is quite similar to the Diptyque colored glass candles — of course the black Baies being most aesthetically similar. 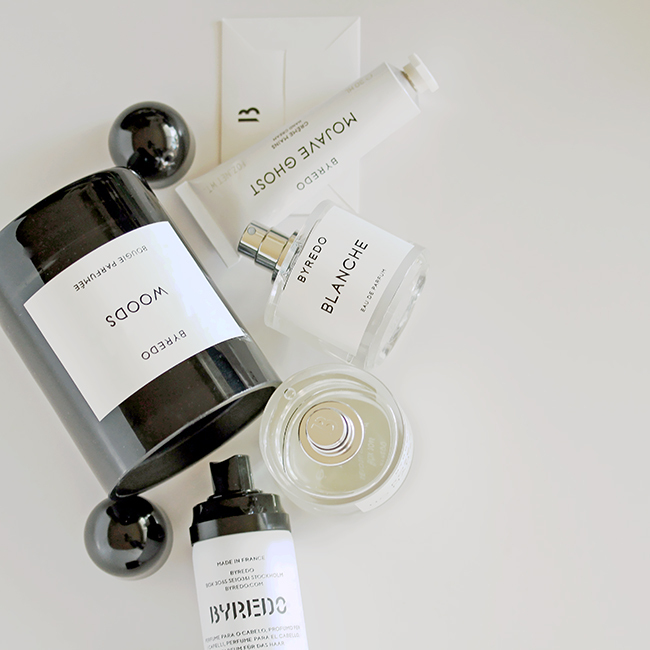 Although Baies will forever have a place in my heart, I have been exploring more unisex and earthy home fragrances lately. It really does smell like I'm taking a walk beneath the trees due to the tuscan leather and white cedarwood. The mood isn't too dark though, thanks to the raspberry top notes and jasmine petals heart notes, so I highly recommend it! The wax is really long lasting so it needs to be burned for a while, about three hours the first time and one to two hours each time thereafter so it'll burn evenly but the key is trimming the wick to 1/4 inch before each burn. Byredo says each candle will burn for 60 hours when cared for properly so that's at least thirty good opportunities to enjoy the fragrance. Also, I keep all my candles covered with lids or in their original boxes to prevent dust from settling on top of the wax. 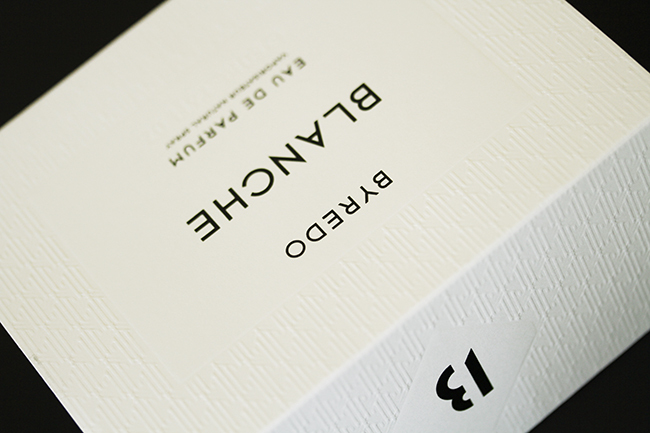 Byredo's come in a very sturdy and chic two-piece box. I still have yet to explore the entire fragrance line-up in real life. I'm so curious to find out if cult favorites Bal D'Afrique and Gypsy Water Eau de Parfum will pair well with my skin chemistry! Even though I have a dull nose, I am extremely sensitive to certain notes so I have to avoid heavy/true florals and many other notes give me headaches. I'll keep you posted!